1957 marked the centenary of the founding of James Taylor & Son makers of hand sewn shoes of the highest class and experts at semi-surgical and orthopaedic footwear. Until 1952 at 82 Great Portland Street, W1 and now at 4 Paddington Street, Baker Street, London, W1. In about 1842 James Taylor of Garboldisham, Norfolk having served his apprenticeship to his father George Taylor, the village shoe maker, walked to London, and engaged himself to a firm in the City of London as journeyman and living in Dean Street in the city. He became a citizen of London and a livery man of Louriners or Spurmaker Co. He married Lucy and his eldest son George James also became his apprentice and a citizen and Louriner in due course. In 1857 he took over a business in 82 Great Portland Street with a lease from the Portland Estate to 1892. In 1874 George Taylor became a partner and the business grew with their reputation for skill in fitting people and the craftsmanship in making people comfortable and able to walk. Being adjacent to Harley Street many of the surgeons and physicians sent their patients to 82 Great Portland Street. Among distinguished customers were King Boris of Bulgaria, and Princess Charlotte of Saxe Coberg Sister of Kaiser Wilhelm II, The Dukes of Portland, Newcastle, Hamilton, Earls Mount Edgcombe, Rosebury, Donoughoure, Hardwick, Halsbury, Jellicoe, Marques of Abergavenny, Lords Goddard, Burkett, Oaksey, Wills. The heads of most of the big West End firms Maples, Peter Robinson, D H Evans, John Lewis, John Barnes, W A Gilbey. 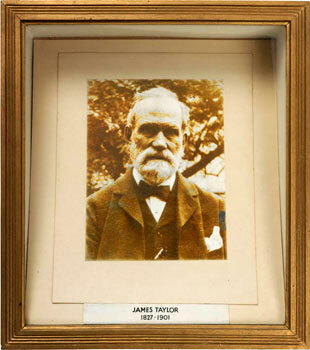 In 1891 Ernest Taylor, son of George Taylor, joined the firm and Frank Taylor another son in 1892. The Portland lease having ended in 1892 a new lease of 60 years only was granted which ended in 1952. On the termination of the 1952 lease, it was found uneconomical to pay the increased ground rent demanded, and both Mr Ernest and Mr Frank Taylor being well over 70 retired. The business was transferred to 4 Paddington Street to Mr Hannes Schweiger an orthopaedic expert who with the assistance of some of the staff from 82 now carried on. During the 100 years the relations believed the firm, their customers and staff and their work people have always been most friendly. In many instances three generations of customers or more. During the hundred years James Taylor & Son have not advertised and their craftsmen have not been on short time. Written by Frank Taylor circa 1957. The next 50 years written by Peter Schweiger 12th February 2007. Frank and Ernest Taylor continued to see customers by appointment up till the mid sixties. My father ran the firm together with his business partner, Ruby Hyatt. They secured an NHS contract and patients came from a large number of hospitals all around Britain. Very often they were people who the local contractors had not been able to help. In 1966 Thomas Holland of Mount Street Mayfair was absorbed into the firm together with their customers and a talented last fitter, called Harry Carpenter. He retired in 1996. I worked with my father for six months in 1964 and then trained as a forester with the Forestry Commission. On completion in 1970 I could not find a job. My father had died in 1968 and the firm was struggling financially, so I decided to rejoin the firm and learn as much as I could while Ruby Hyatt ran the firm until she retired in 1972. It was daunting to take over staff who were all a lot older than my tender 26 years. The bookkeeper left and I found one who then cheated the firm and was sent to prison. During the 70’s Taylor’s took over several shoemaking firms whose principals either wanted to retire or whose leases had expired. There have been difficult times over the years and the NHS contract was usually the cause because the prices were low, payment was slow, and all sorts of conditions were imposed. That contract was ended in 1990. Inflation during the early 80’s reached 30% per year which was amazing and yet another challenge. Mr W. Wilson who had been with Taylor’s since 1932 retired in 1986 and we were lucky to find a skilled designer to continue with the pattern cutting. Having been through the practical training of a forester I used some of the techniques to train new crafts people. Mostly they worked first in the shop seeing all the many types of conditions that people have and how they could be solved. Then they progressed to learning the practical skills in the workshops from longer serving staff and myself. My wife and my daughter have also worked with me and given a lot of input, which has seen the firm prosper in recent years. The internet has been a boost. Crafts seem to be appreciated more, although shoes are more than craft or art. They have to fit the eyes as well as give comfort during every step. A miracle in motion! With a good team of miracle workers James Taylor & Son should continue as long as people have needs that ready made shoes cannot meet.